Suggesting also that it may time for Canada to think of the U.S. as a foreign country. As this article from the Buffalo News reminds us, on June 1, 2009, 12:01 AM, the Western Hemisphere Travel Initiative takes effect. Needless to say, the line-ups to apply for a NEXUS card is likely quite long at this point, as well as the line-ups for passports on both sides of the border. If Obama is irked with Canada, that’s his right by why punish Americans? This entry was posted in Uncategorized on February 9, 2014 by renounceuscitizenship. As the above tweet says, this is one for the ages. Talk about a reinvention of reality! 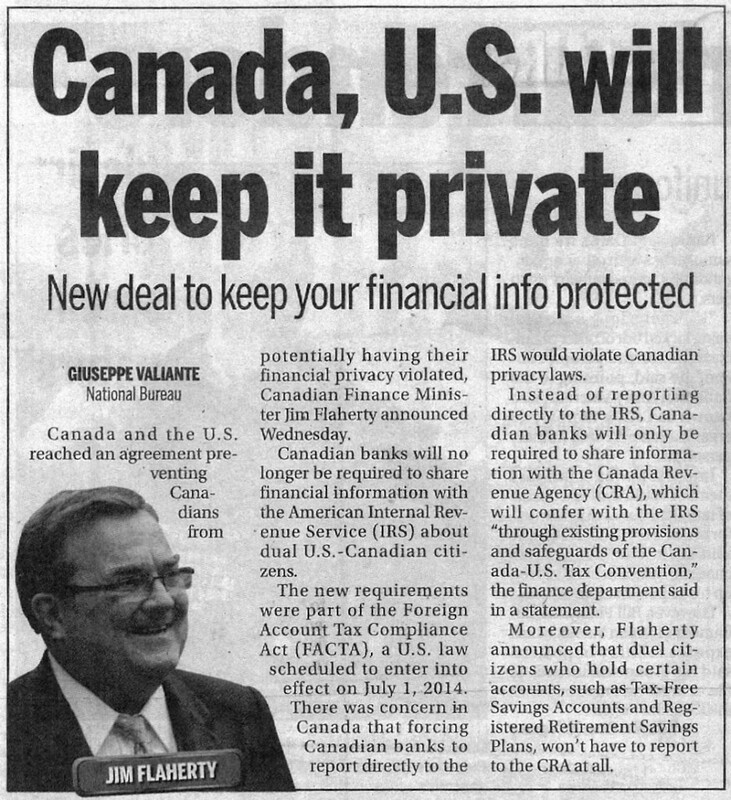 This entry was posted in FATCA and tagged FATCA Canada, FATCA IGA on February 9, 2014 by renounceuscitizenship. To be clear: A video is worth a thousand words! More videos are worth more than a thousand words. I have taken a “comment exchange” between an Obama supporter and @Just Me and turned it into a post. Just Me lays out the chronology of Obama, the Democrats and FATCA. This entry was posted in Citizenship-based taxation, FATCA, FATCASpeak and tagged Americans Abroad, FATCA, Geithner, Levin, Obama, Shulman on February 7, 2014 by renounceuscitizenship. FAQ 54 : If you have a retirement or pension plan in a foreign country (other than a plan described in FAQ 54) for which you believe there is no U.S. reporting requirement and that you believe should not be included in the offshore penalty base, you should contact the OVDI hotline at (267) 941-0020. Due to the groundswell of international interest in FATCA, I thought that our asteroid would share our decision process with your leaders of your asteroid. I know that Obama’s Treasury goons are threatening your banks with 30% withholding sanctions if you do not comply, and various other sticks and marginal carrots behind the closed doors on your asteroid, so it is important that you weigh all of the factors prior to your capitulation and delivery of your bank data, corporation data, and citizen data to the Internal Revenue Service of Planet the Galaxy (IRSoG), formerly known as the IRS of USA. Check to make sure that no one in your family and no one in your circle of friends is a US person. This entry was posted in Uncategorized on February 6, 2014 by renounceuscitizenship. Great article – see in particular the comments talking about FATCA and people with no connection to the U.S. except by birth. The U.S. is now using the 14th amendment (if you were born in the U.S. you are a U.S. citizen to create slavery. Under no circumstances should any agree to any aspect of FATCA which is a tool to create slavery! This entry was posted in Uncategorized on February 4, 2014 by renounceuscitizenship.